Blue is a cool color known for its ability to induce a sense of profound calmness and relaxation. 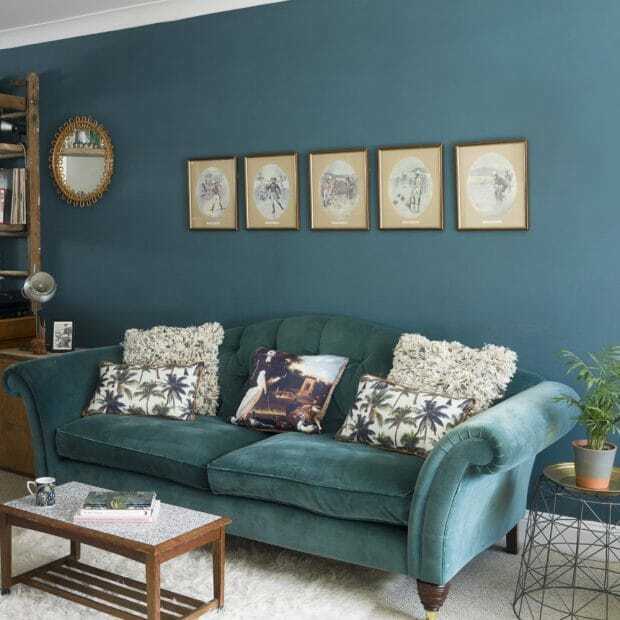 This color is extremely versatile when it comes to using it to decorate your home as there’s a wide range of blue hues from restful and sophisticated navy to warmer teal shades or more luxurious darker tones. 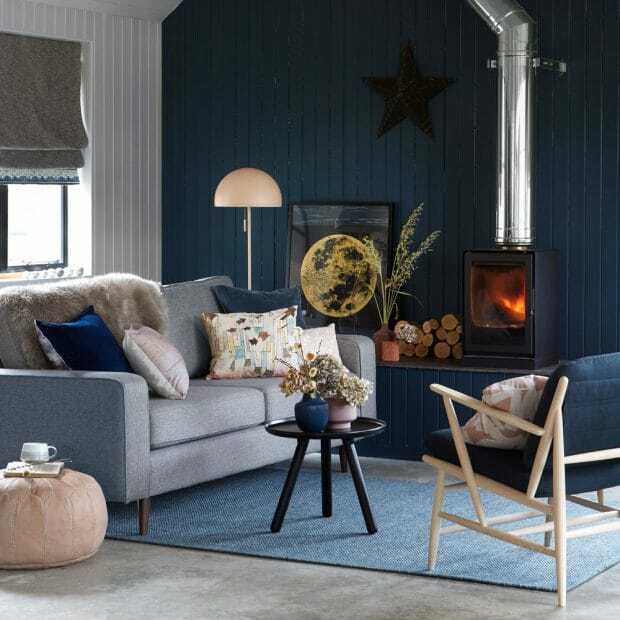 The living room can definitely benefit from some blue touches for the furniture, accessories, or for other elements as this is an important area of the home. 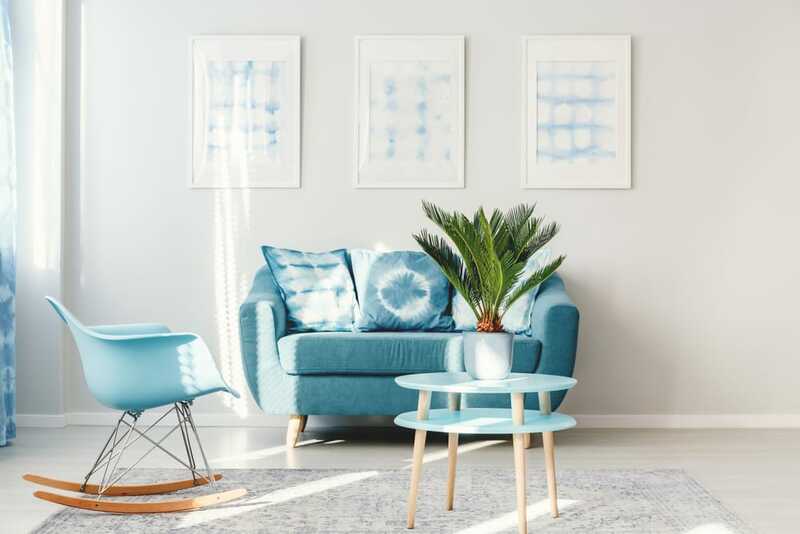 If you’re ready to incorporate more blue into your living room décor, check out the following tips that should inspire you regardless of how subtle or bold you want to be. The simplest way to add a touch of blue in the living room is by incorporating it through furniture pieces. A blue sofa makes for a vibrant pop of color in any living room. Keep the background elements in more subdued shades of neutral colors such as white and gray. For a matching atmospheric effect, consider painting the walls in a denim blue to make a great pairing with the ocean blue of the sofa. To complete the look, don’t forget to include some subtle blue decorations in a white dresser. Vibrant shades of blue will usually take your mind to modern décor. If you want to stick to a more traditional look for the living room, consider going for a teal blue when updating the pieces in the room. It’s hard not to fall into the trap of creating a tired feeling when using this teal tone. That’s why you need to be confident when decorating to incorporate the right amount of traditionalism to keep things fresh. 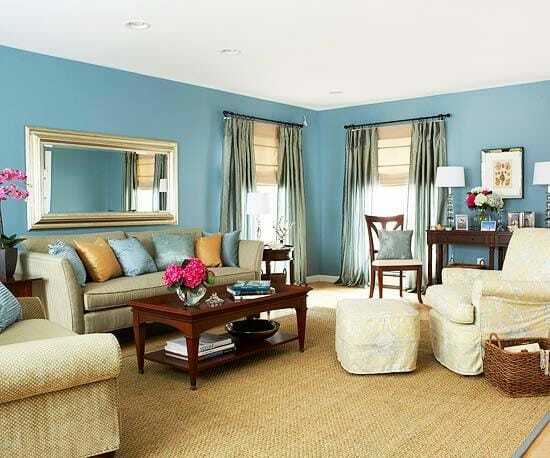 Similar to the previous idea, try combining the blue shade of the furniture upholstery with the wall color. The resulting effect can be considered bold, but when using teal blue you can obtain a more calming atmosphere. 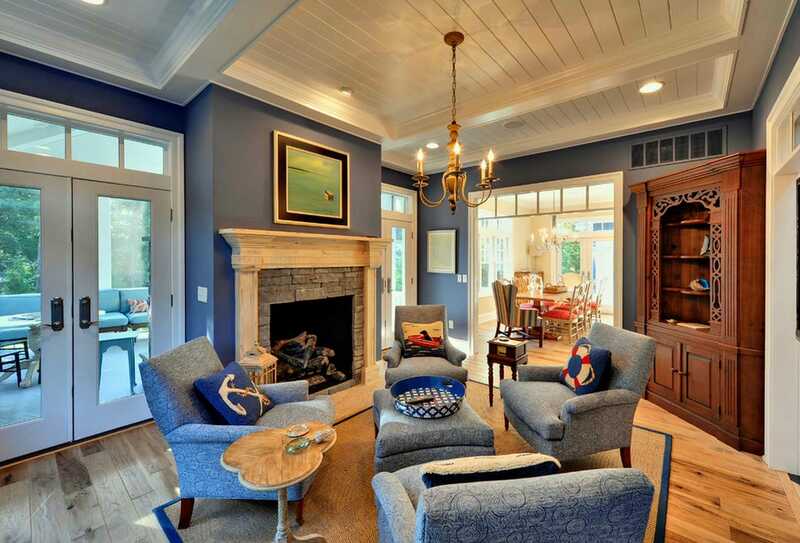 Letting the blue color dominate the living room looks good when you include a mix of antiques and modern elements. If you’re feeling more playful, it’s a good idea to include some blue patterns when designing your living room. Go for neutrals when it comes to the background elements such as the walls and floor. This provides the perfect blank canvas where you can add splashes of blue through imaginative patterns. Even if the motifs used aren’t similar, they can still work well together to create a more eclectic look. Another important aspect regarding the color palette is to stay within some clearly defined limits when it comes to blue shades. Don’t combine bright turquoise with dark teal as it can disrupt the harmony of the room. Experimenting with patterns can be done through a multitude of décor elements such as curtains, rugs, blankets, throw pillow covers, or artworks. Take a look at these stylish navy blue curtains on Amazon to get inspired. 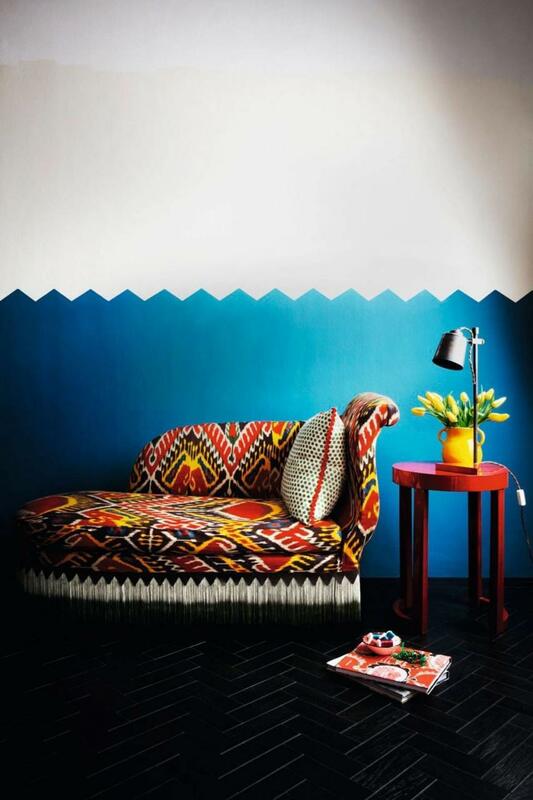 Decorating in the bohemian style can often make use of copious amounts of blue as demonstrated by this living area. 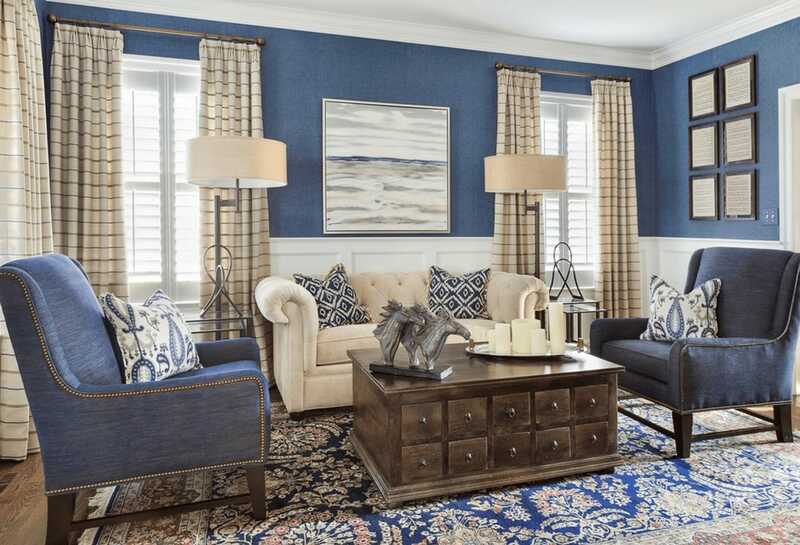 It’s not easy to pull off this specific look, but try to take a close look to the way each shade of blue is incorporated to create a unified design. There are hardly any accent colors here as it looks like everything contains a blue touch. To prevent this great amount of blue from being too suffocating in a visual sense, consider letting out plenty of natural sunlight through large windows. Not everyone loves decorating their living room with intense blue elements. Sometimes it’s preferable to stick to more delicate shades of blue to include just a touch of soft elegance to the area. Get inspired from this stylish designer look where a vivid blue is used only sparingly for accenting purposes. The true focus is on calmness as evidenced by the subdued hue used for the sofa and walls. Delicate blues have the ability to induce a sense of comfort that’s always welcomed in a living room. A home library is usually positioned in the living room. If you’re looking to improve the ambiance when reading, one of the best solutions is to add some cozy shades of blue. 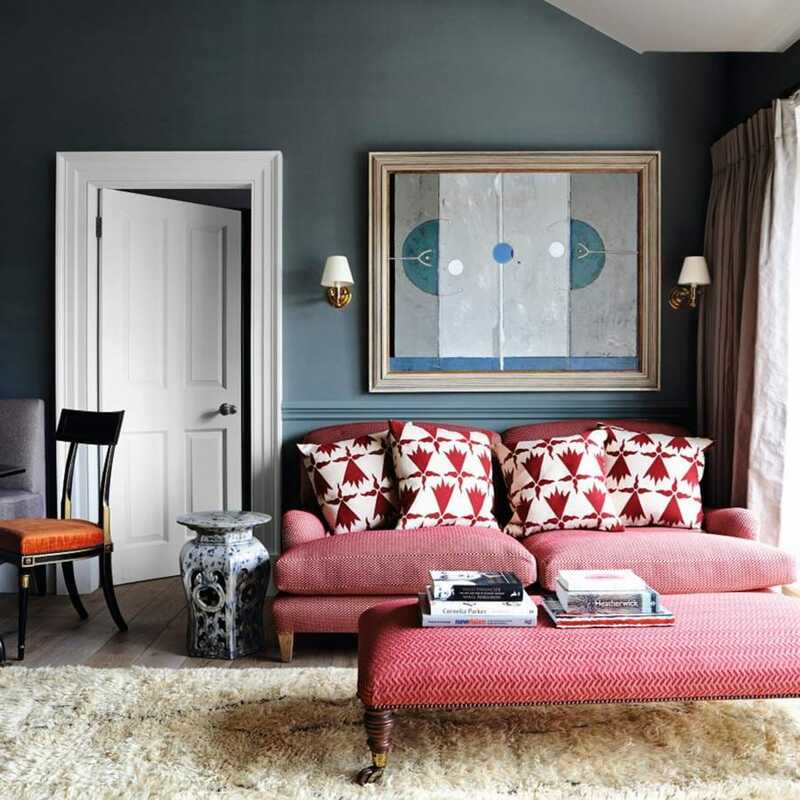 This designer living room avoids the dark feeling of too much blue by including some contrasting orange that offers some much-needed warmth to counter the coldness of the blue. The blue bookcases look spectacular with the matching walls. If you wish to make your living room stand out, adding some color is always a great option. 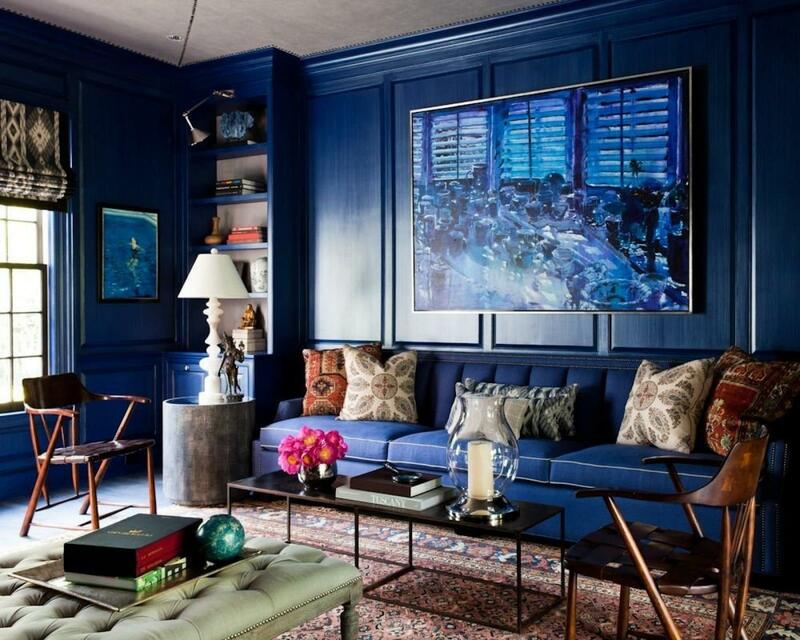 Those with a flair for the dramatic will probably like the glossy blue style of this room. Dark blue paint totally transforms this room making it seem so much more exciting and vibrant. While many people would rather choose a matte finish for an elegant look, this glossy style seems more fitting when dealing with this dark shade of blue. Some living rooms can make use of contrasting shades to create a memorable impression. 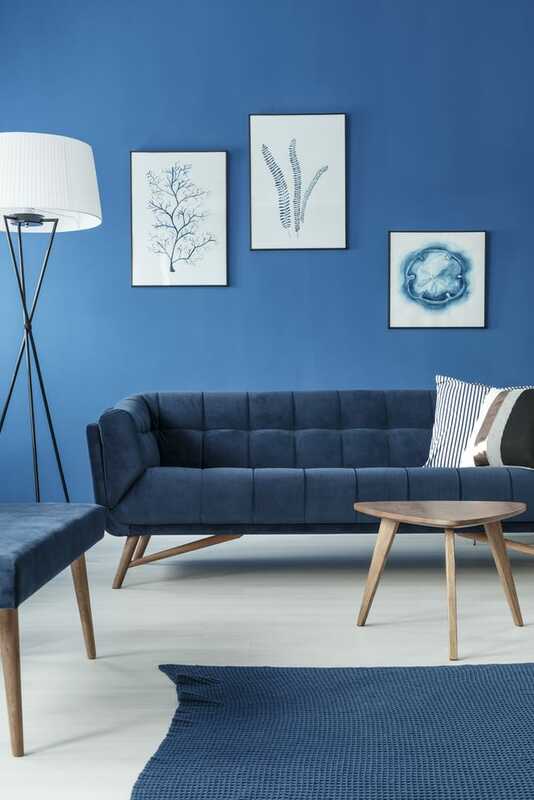 We like the way this blue artwork and walls combine with the red upholstery of the furniture. To complete the look, there’s plenty of fluffy texture added thanks to the expansive beige rug. This is an elegant oasis that offers a very balanced mix of colors. Blue and white is an excellent color combination that can make the living room atmosphere feel more relaxed than ever. The classic vibe of this match can be balanced with some contemporary patterns. For extra style in your blue living room, consider adding some geometric blue rugs or some abstract artwork. Splashes of blue can take many forms, including through beautiful throw pillow covers. Here’s a good example on Amazon. These are stylish covers with modern blue and white designs. While blue is usually associated with coolness, darker shades can have the opposite effect. A room with dark navy elements can become cozier. This could be an ideal shade for recreating a modern rustic look in your own living room. 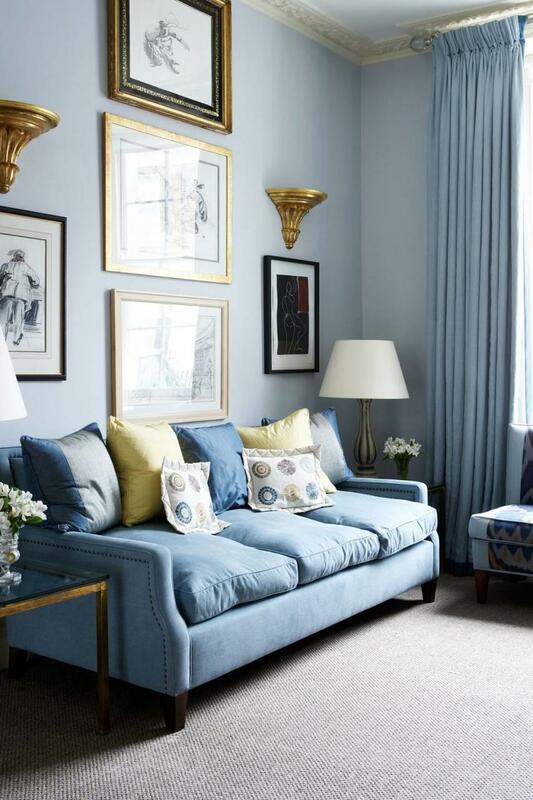 The beautiful blue hues combine well with greys from the sofa and floor to make the room airy and bright. A few pink accents complete the general soft ambiance crafted by these blue elements. Anyone who likes including a lot of wood elements into their living room décor will notice the problem of obtaining the right contrast with the wall. It’s an awesome idea to rely on a more neutral shade of blue in this case as it can work better than white or more vibrant hues. The contrast is subtle but effective at emphasizing the beautiful woodwork. Vintage furniture can make great use of some refreshing fabrics and plenty of surrounding textures. The blue tones in this room create a nice visual effect with the screen porch resulting in some stylish coastal vibes. The river outside offers some beautiful reflections against the cream room. Blue shades help to accentuate and complete the fresh feel making the vintage pieces feel more comfortable. 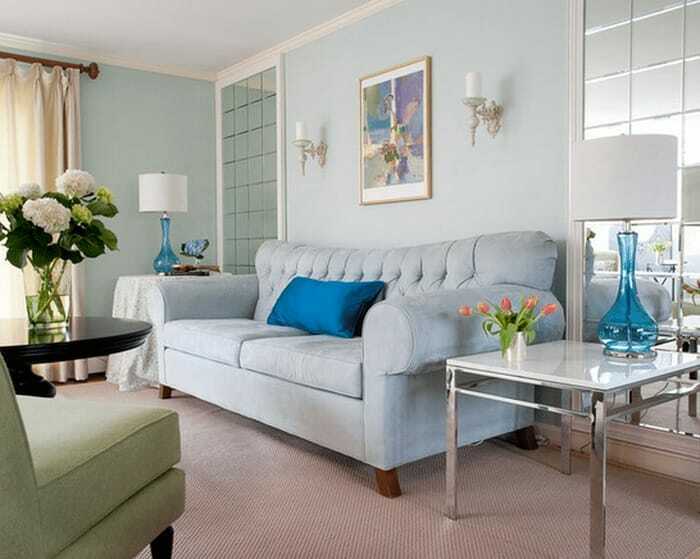 Light blue is very effective when paired with the right colors and elements. If you’re trying to create a cottage-inspired look, it goes without saying that you need to incorporate plenty of tan and wicker elements. Airiness is provided by some white accents like the curtains or the coffee table. The only thing missing is a sense of relaxation. This can be achieved with the help of light blue shades that keep the scene grounded in calmness. 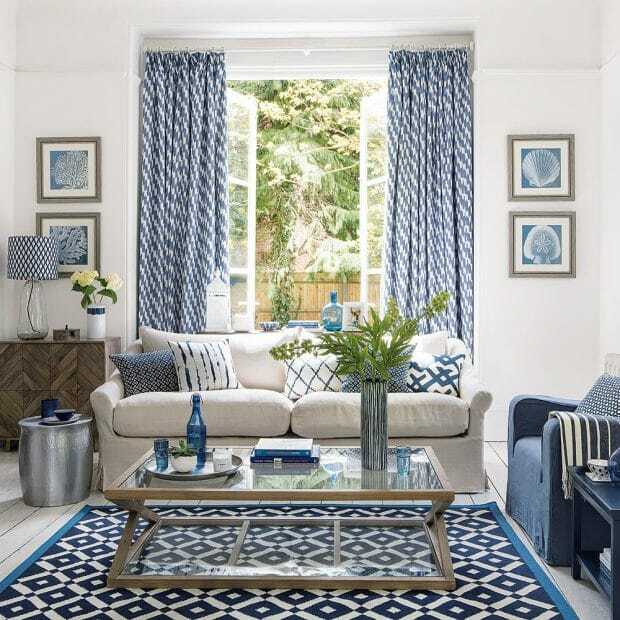 Another amazing combination of white and blue, this living room benefits from elegant visual aesthetics thanks to a stylish hue of cornflower blue. The contrast with the dominant white elements in the room is very soothing as the color is only found on a small sofa and a few accents. Different patterns combined with the abundance of natural sunlight gives off a countryside feeling for this room. While pink is usually too sugary for sofa upholstering, the shade can look surprisingly mature when the background has the right color. In this case, the ideal solution is to choose a dark inky blue to add a bit of casual sophistication into the mix. Some glamorous finishes like the leaf decoration or the gold legs of the table complete the overall grown-up look. It’s also interesting how the room feels cozy with the help of fluffy throw pillows and the soft geometric rug. Blue can feel a bit overpowering in some living rooms. Those who favor a more traditional approach can still make great use from its stylish hues. The secret lies in incorporating restrained blue, just enough of the shade to give some personality to the otherwise bland architectural details. Even without the furniture in place, the walls can take great advantage of a subdued shade of blue. With some added gray furniture, the look of the living room really takes off in terms of visual depth. 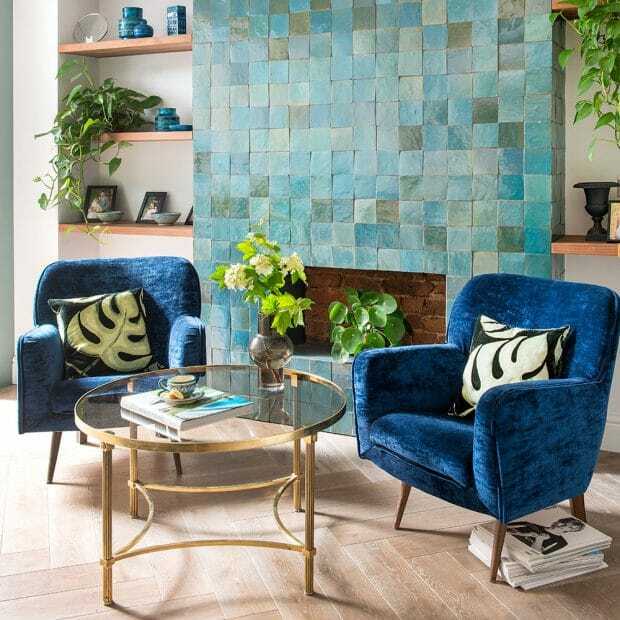 A unique approach to the idea of creating a statement wall is by featuring one made of cement tiles painted with stylish blue hues. This is usually the kind of material that you’d expect to find in a rustic environment so it’s somewhat strange to see it together with glamorous elements. The combination works thanks to the way blue ties all the pieces together and creates a harmonious look. Pale blue shades from the tile wall contrast with the deep and rich blue of the velvety chairs which convey a sense of elegance. The eclectic style is known for trying to combine different elements and create an all-encompassing design. Blue fits nicely in that regard as it’s capable of making any home décor more beautiful. Having a stunning blue backdrop using the depth of the walls represents a great technique to emphasize some unique furniture pieces. It also helps you create a bold statement through decorations whether they’re modern or traditional items. 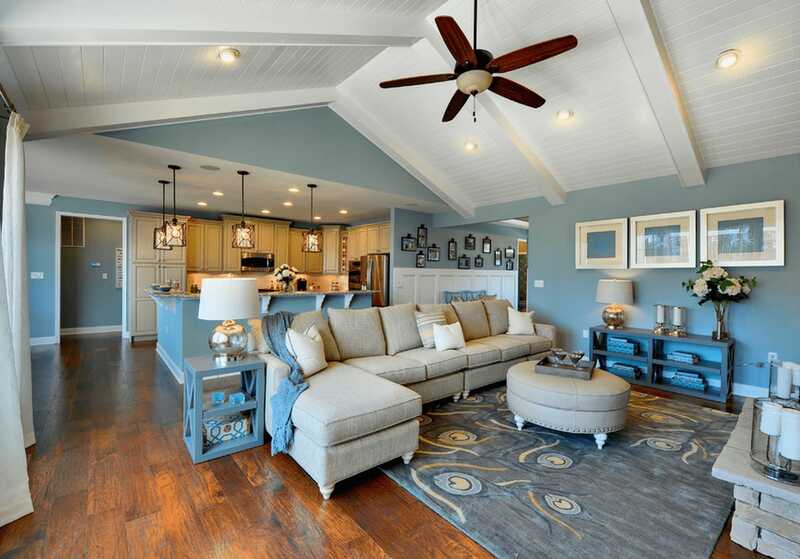 Blue is great for living rooms including those that feature an open concept kitchen. Using lighter shades of blue you can boost the airiness in the room and create a breezy atmosphere reminiscent of coastal regions. Your beach house can definitely use more blue and there are so many ways to incorporate it beyond just painting the walls. Add a splash of playful blue on a sand-colored sofa using accessories such as blankets. Check out this soft throw blanket from Amazon. The electric blue color is sure to add an exotic touch anywhere it’s placed. Modern living rooms look great with a monochromatic background which allows for creative freedom to showcase colorful artwork or treasured photos. 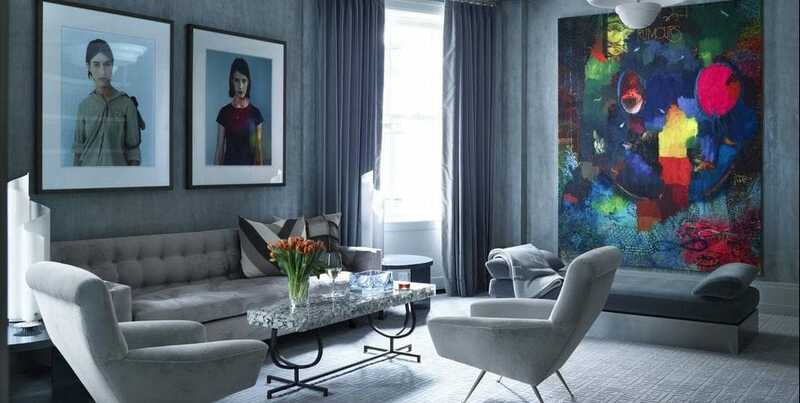 Blue pairs with grey very well for this kind of modern look as it develops a moody atmosphere. With a few elegant furniture pieces and the right accessories, you can complete this luxurious look. 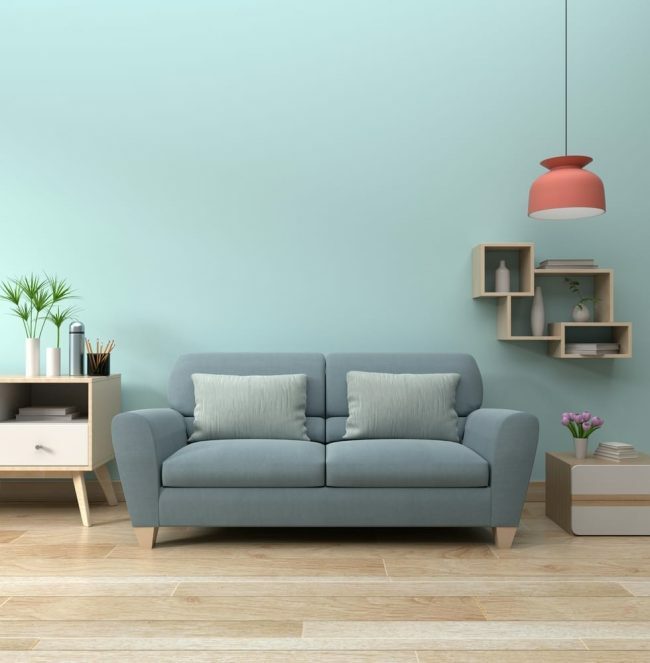 Those lucky enough to have a spacious living room should strongly consider getting a large blue accent to cast a brilliant visual effect against a neutral backdrop. The combination of the large oval rug with the round chandelier is absolutely gorgeous. The entire room gives off the impression of a tranquil oasis. Blue is a versatile color that seems to play nice with lots of vibrant shades including gold. Combining the main blue elements with some gold accents represents a smart design choice for this living room. The calm palette dominates and enables the gold finishes to shine and make a stylish statement. 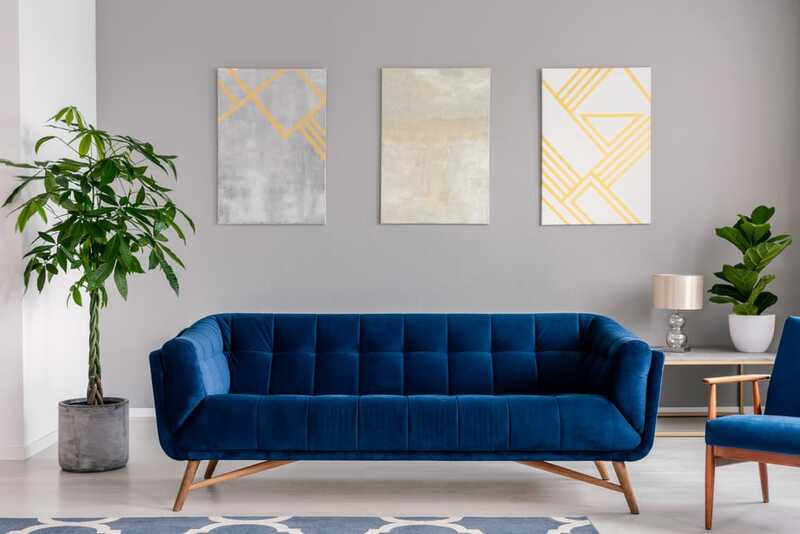 Gold and blue together have the power to revitalize any living room. Any beach house out there can take advantage of blue for the living room. It’s the obvious color to choose if you wish to add a nautical theme to the area. 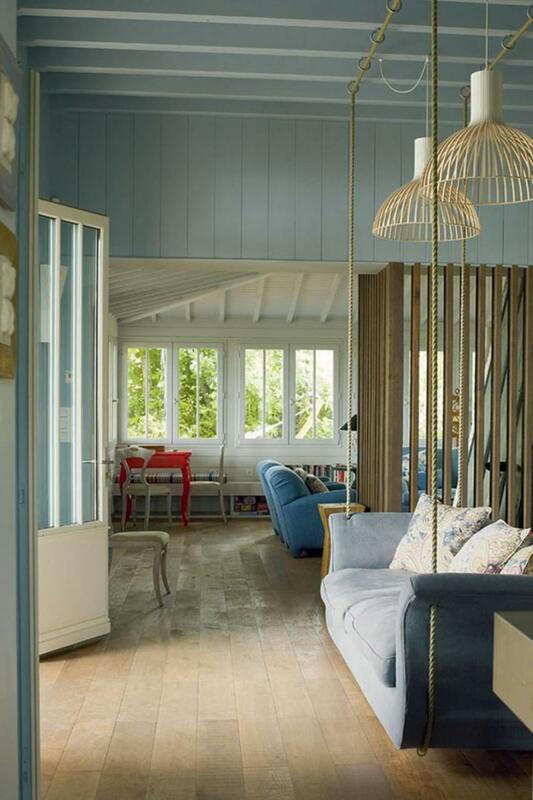 We like the idea of suspending the blue sofa with the help of thick ropes. Pairing it with a sea view results in a unique arrangement for the living room. Once again we see the contrast of blue elements against tan pieces which represents a classic beach combination. With blue walls and a wooden floor, you’re basically halfway there to adding a strong nautical flair in the room. Blue looks lovely on the walls and the same feeling of calmness can be transferred to the ceiling. A glossy finish can make a particularly striking impression. 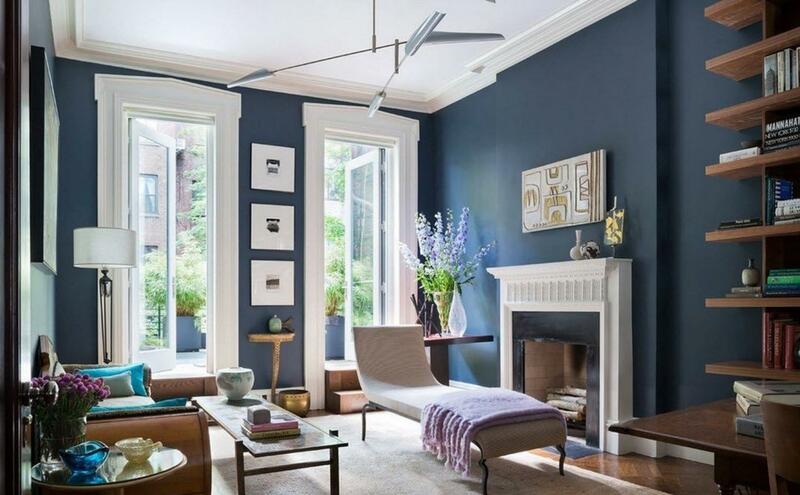 This designer living room has a blue trimmed ceiling for some added contrast and visual interest. Various colorful motifs from the sofas and flowers used as accessories complete the luxurious and refreshing look. A midcentury chandelier takes care of the lighting. A gold lighting fixture in this style can be found on Amazon. It’s an ideal match for a blue ceiling. 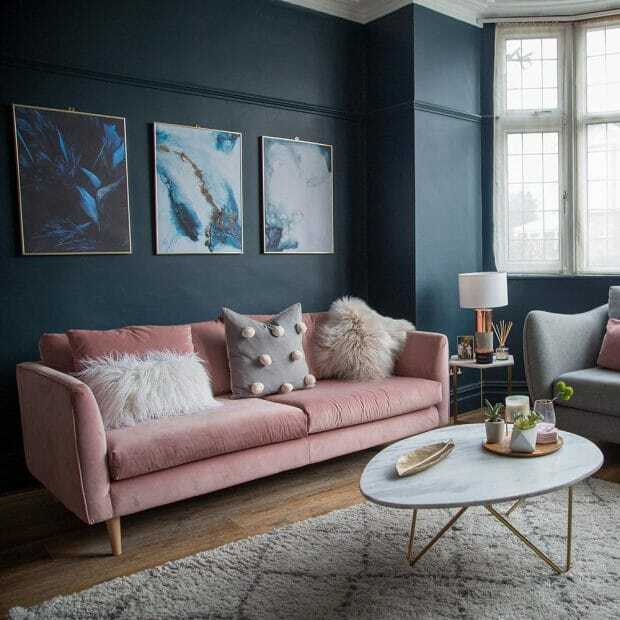 Using deep and rich blue shades for your velvet sofa represents a nice solution if you want to create the impression of opulence. This is definitely the kind of custom upholstery that can easily go over your budget. With the right accessories though, the blue furniture can transform any living room and provide its own personality. 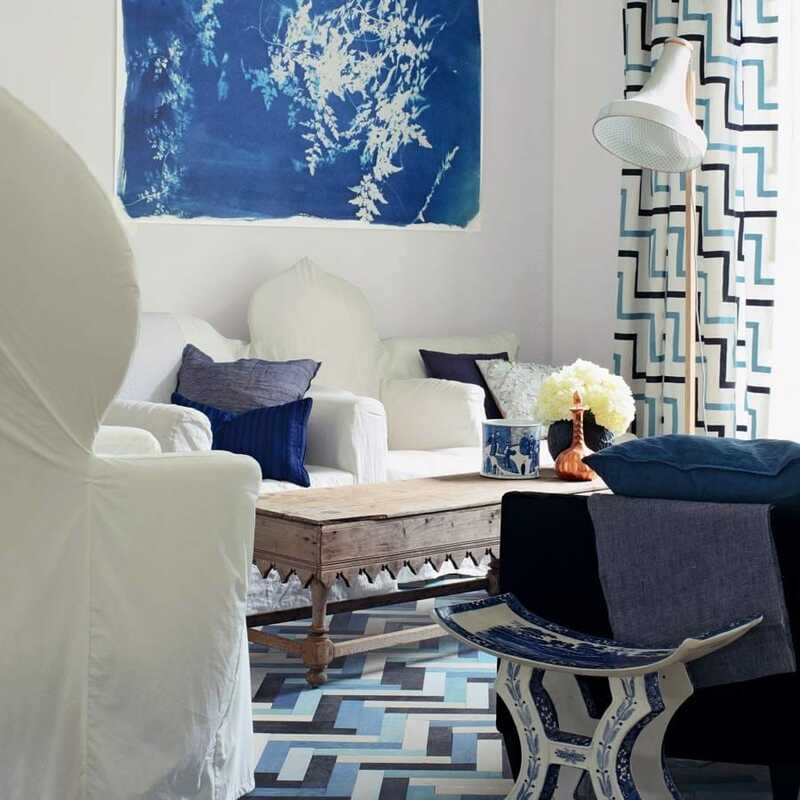 Shades of blue have made their way into a vast range of interiors for hundreds of years. Blue has a timeless quality that you can capture in the living room by using the right pieces and accents. A classic cream sofa flanked by elegant blue chairs deliver the kind of timeless impression that blue encapsulates. The beauty of this particular shade of blue has the ability to withstand the test of time even if other hues will go out of style. An industrial living room can integrate blue even if this color isn’t frequently used for this style. It’s recommended to go for some splashes of blue in case you don’t like the idea of a complete industrial makeover. 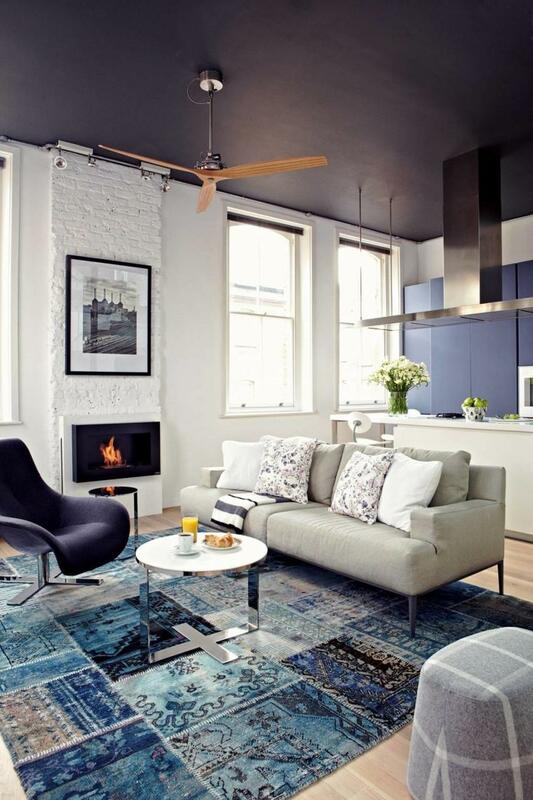 The rug with blue patterns together with the indigo ceiling create a pleasant contrast with the white brick wall. While blue by itself doesn’t usually create an exotic look, it can provide the vibrant background necessary to showcase some vivid patterns and colorful accessories. The color palette for this living room is certainly leaning towards exotic vibes. The daybed has a brightly-colored design which takes inspiration from the boldness of Ballets Russes costumes. To enhance the contrast even further, there’s a patterned black parquet floor in the room. Some living rooms need a fresh makeover to transform them into livelier places. By combining light blue with soft greens and oranges in this living room, the resulting visual effect is beautiful. The entire room seems to come to life and all the colorful accents add a touch of whimsical without making the shades compete with each other. This is because the tones aren’t bright enough to make the room dramatic. Walls painted in a rich matte blue stand out in terms of elegance. The living room’s furnishings seem to pop when paired against such a warm teal hue. We like the overall warmth of this room which takes a careful approach when choosing colors. The selection of neutral-tone fabrics and honey-color wood looks inspiring for anyone who wants to bring a more casual and rustic feel to the living room. Elegance is maintained with the help of satin pillows and draperies.